Shortly after the 2018-19 school year began, Professors Black and Hartwick of Hufflepuff ran an activity in one of the Sett forums dedicated to the various minor characters and places of the Harry Potter universe. Each week was dedicated to a different 'theme': week 1 was professors, week 2 was students, week 3 was magical shops and week 4 was animals/creatures - and there were puzzle and discussion threads each week matching the theme (plus a coloring page the final week). Every day, Professor Hartwick would also ask us a trivia question that fit that week's theme; if you answered it right - or participated in the other tasks - you would get diamonds! 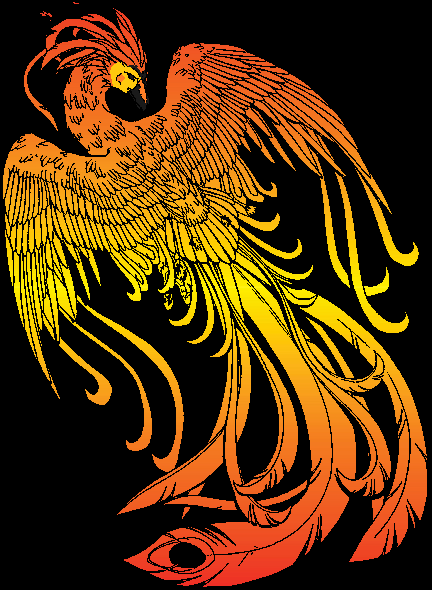 This is the Phoenix i did for the Week 4 Coloring activity....I'm pretty pleased with how it came out! Your phoenix was and is incredibly beautiful, Arianna. I remember when I saw it and I just 'stopped'. Wow. It'd make an awesome siggy or avatar! Thanks for writing about Supporting Cast, Will. Congratulations on being the person who got more Diamonds than anyone else! 391 (three hundred and ninety-one). Well done! Fels had the idea of wanting to spotlight folks who are the Supporting Cast of the Harry Potter stories. We divided up ideas and this time spotlighted professors (teachers), students, shops and animals. As Will wrote above, we had 2 or 3 tasks or puzzles and a discussion topic each week. Fels did the daily trivia (YAY!) and each day came up with a question about our chosen topic of the week. We're hoping to have a Supporting Cast Two activity -- there are so many more things which make up the stories that we can focus on!